Great insight Phil Fersht. RPA is the equivalent of 'assembly line' in manufacturing and 'AI' will be the automated work that the assembly lines enabled. Good analogy...I would not go as far as Drug though! @Sachine: well... it's got a lot of people hooked ???? "where they (operations executives) can - for the first time - fundamentally change how a process is designed to process data much, much faster." We can see that for some vendors process change (reengineering) is anti-pattern of delivery as it adds additional risk - facilitate behavioral change within big companies with complex ecosystems and politics. "firms have the chance to make fundamental changes to how they design workflows, instead of persisting with doing things the same old way" Again they have chance but can easily select path of quick benefits realization of processes automation AS IS without any changes. At the end of the day they will get infra where changes are even harder now as in addition to old infra they need to support automation layer. Great article for those that know. That said, at this critical juncture in RPA and AI growth for real business value, we still need to win over those with fear and uncertainty. Headlines and sound bites are what catch the eyes and minds of those not yet bought in. I’m in it - deep - drank the koolaid - understand and appreciate the “gateway drug” analogy. Im suggesting that may not be the favorable light with which to paint what we know works as we try to convince others. Positively framed, real life achievements in colorful, relatable storytelling is what we need more of. RPA is definitely an enabler and is in the same shiny new object category as AI. Only 13% RPA at industrialized scale is largely due to legacy paradigms and methodologies being applied. Business operations AI will face similar challenges. 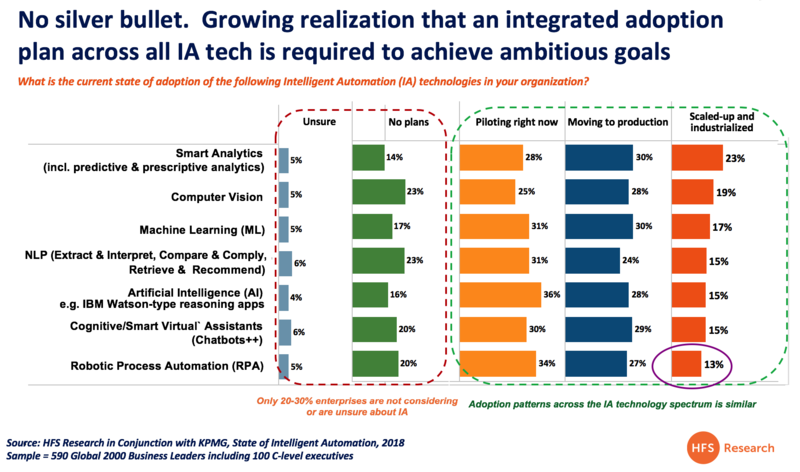 Point AI solutions and their rate of advancement will catch much more interest than RPA had when it was at this stage, however AI doesn't have the legions of process automation consultancies to adequately/inadequately respond. Maybe that is a good thing as they might be forced to come up with an AI appropriate paradigm. Some of what presents as hype relates to the technology being ahead of the carbon based life forms ability to effectively apply it. Agree/applaud the overall argument Phil, thanks! But presumably "digitize your underlying mess" means "fundamentally reconsider customer-oriented process opportunities exposed by (even a basic) RPA capability"? PS: Where is Thoughtonomy on the continuum? I would argue that Service Orchestration tools like Enate are the true enablers. RPA is just one digital resource out of several (OCR, AI, ML, bespoke rules engines being some others), which coupled with your human resource, represent your new C21 hybrid workforce. If you can’t effectively orchestrate workflow across the entire business process you can’t achieve scale. If RPA is the gateway drug, orchestration is the dispensary! Amen Phil. When people start defining RPA as something that it isn't, the hype goes into hyperdrive. Would like some thought leadership on the what the motivation for this twisting of reality is. Whereas, is it just smoke to hide the truth that RPA is dumb automation, 20+ year old tech and has the same issues of automating old tired legacy apps that plauged the screen scraping era? How else did so many RPA vendors appear from nowhere? Boom, there it is! Someone who doesn’t hype the hypeable! Great work Phil. RPA is an opportunity for all, it’s not rocket or data science! Great article. RPA has helped by digitalising solutions and helping businesses resolve their painful manual process issues. Currently I’m seeing more confidence and comfort as the roadblocks are being removed and more bots are deployed by companies. Some now have over 1000. It’s natural to want more and reach for the next stage - it will take time as RPA did to decide the next logical steps. Exciting journey. Well put! Actually, RPA can be viewed as an enabler of such technologies as AI or ML (side note - those two are not quite the same thing as well). 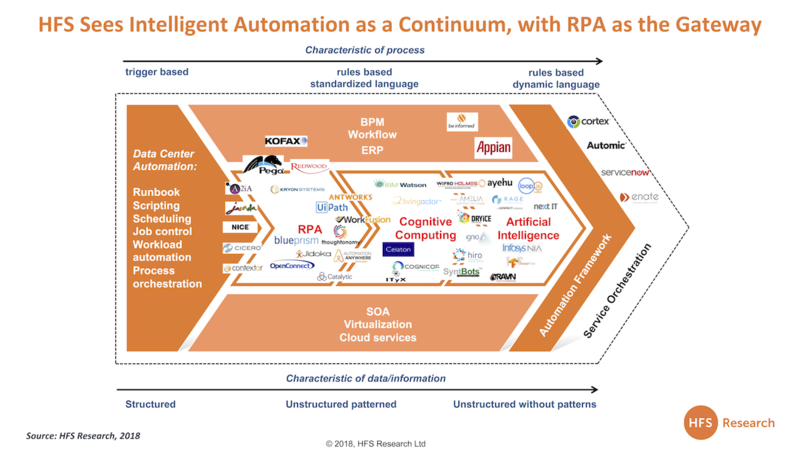 RPA also launched a renaissance period for such technologies as OCR and Desktop Automation. But RPA = AI? Well... having a laptop doesn't make you a computer scientist, is it?.. So where does "Fake AI" go from here? One only needs to look at the 50% collapse in Blue Prism"s stock price, for a start???? But Phil... not is so much sexier than macro! Nice analysis of the landscape. No one tech is a panacea.